A Russian Soyuz ferry craft glided to a computer-orchestrated docking with the International Space Station early Tuesday, bringing a Russian cosmonaut, a NASA astronaut and a Japanese engineer to the lab complex two days after launch from the Baikonur Cosmodrome in Kazakhstan. 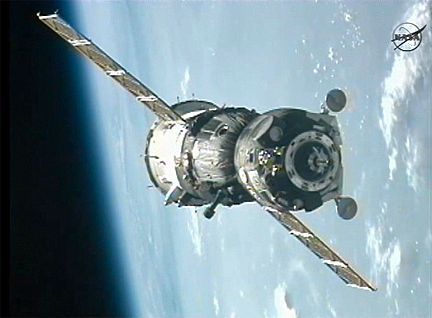 With veteran cosmonaut Yuri Malenchenko monitoring the autonomous approach from the center seat of the Soyuz TMA-05M command module, the spacecraft's docking system engaged its counterpart on the Earth-facing Rassvet module at 12:51 a.m. EDT (GMT-4) as the two spacecraft sailed 252 miles above northeast Kazakhstan. 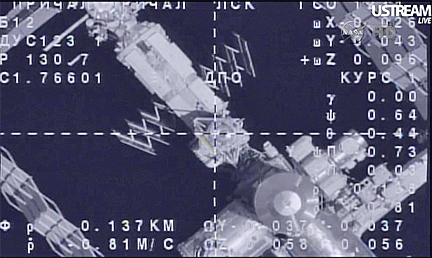 "Docking confirmed," someone said on the Russian flight control loop. A few moments later, the docking mechanism pulled the Soyuz snugly into place for extensive leak checks, standard procedure before hatches could be opened. The linkup occurred on the 37th anniversary of the Apollo-Soyuz Test Program docking in 1975, the first joint U.S.-Russian space mission. "Congratulations to our crew and to our Russian partners," said Mike Surber, director of NASA operations in Russia. "It's a very exciting day as it's the 37th anniversay of the handshake between our two countries during Apollo-Soyuyz. And here's (hoping) for 37 more years." Malenchenko, NASA flight engineer Sunita Williams and Japanese astronaut Akihiko Hoshide were joining Expedition 32 commander Gennady Padalka, cosmonaut Sergei Revin and NASA astronaut Joseph Acaba, who were launched to the space station May 15. They've had the outpost to themselves since July 1 when three earlier crew members departed and returned to Earth. Malenchenko is one of Russia's most experienced cosmonauts, going into his latest mission with 515 days in space during a flight to the Russian Mir space station, a shuttle mission and two stays aboard the International Space Station. Williams, a Navy helicopter pilot, spent 195 days in space during an earlier station expedition while Hoshide helped activate a Japanese research module during a 14-day shuttle assembly mission. The expanded ISS-32 crew faces a particularly busy few weeks in space, with the launch and berthing of a Japanese cargo ship, the undocking and redocking of a Russian Progress supply craft to test a new rendezvous antenna, the arrival of yet another Progress with a fresh load of supplies and two spacewalks at the end of August, one by Padalka and Malenchenko and the other by Williams and Hoshide.